Well to start off the team is currently in Worcester Massachusetts. 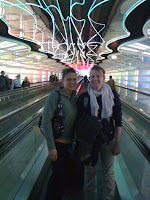 In order to get where we are today, we had to fly approximately 4500 miles from Fairbanks to Boston. Our trip started earlier yesterday which was Tuesday afternoon. After skating at 9:30 at the patty center followed by workouts the team then went home to pack for the trip. The team then met back at the patty center at 2:15 to load team gear and personal bags and headed to the airport for a 4:40 p.m. flight to Seattle. We arrived in Boston are 7:30 a.m. or 3:30 a.m. Fairbanks time. The team felling somewhat tired and hungry was happy to be safely on the ground on the other side of the content. Ironically it is the furthest the team has travelled all year but was by far the teams shortest travel day. After collecting hockey gear and personal items that team headed to a local diner where we devoured a much needed breakfast. From there we travelled about an hour bus ride to Worcester and checked into the hotel. With some downtime before practice most of the players and staff I’m sure took a pre practice nap. Practiced started at 3:30 p.m. and the team is always a little tentative to get on the ice with the time change and the all night flight but today the team was ready to go. There is only 16 teams in the country left playing and we are excited to be one of them. After a good hour skate the team felt better than it did before stepping on the ice. After practice we headed out for supper at a restaurant called 99. Pumped to get a big meal in us we again devoured yet another meal. I nice treat to the supper was Alumni and former CCHA player of the Year Chad Johnson was able to join us and share some stories from his year spent in Hartford and in New York with the Rangers organization. Now I am here in my hotel room writing this blog. Tomorrow we will continue to get ready for Boston College and a chance at a National Championship. Thanks for reading and thanks for your support. NORTHEAST REGIONAL · DCU CENTER · WORCESTER, MASS. The Alaska Nanooks came off a long trip from Fairbanks to Massachusetts for the first day of practice before they take on Boston College on Saturday afternoon in the first round game of the NCAA Regional. 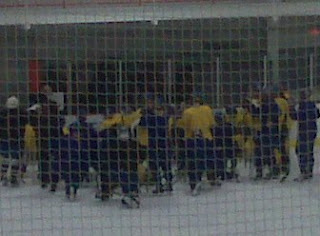 The Alaska Nanooks are on their way to 2010 NCAA Northeast Regional. They loaded up the bus this afternoon before heading to the airport to catch their flight to Seattle and begin their trek to Worcester, Mass. They face the Boston College Eagles on Saturday at 1:30 p.m. Eastern Time (9:30 a.m. Alaska Time). Don't miss the "Party at the Patty" on Saturday morning at 9 a.m. ADT if you are in the Fairbanks area. Bring a blanket to sit in the bleachers or spread out on the gym floor and watch the live game feed, which will be projected onto a bare wall (approximately 28-feet wide) and synchronized to the house stereo system. Refreshments will be available for sale in the Patty Center Lobby and should the Nanooks earn the right to play in Sunday's Championship game, the same set-up will be available to the public free of charge on Sunday afternoon, beginning at 1:00 p.m. ADT. The Northeast Regional Championship Game is slated to begin on Sunday at 5:30 p.m. EDT (1:30 p.m. ADT). Fans not in the Fairbanks area, or who are unable to make it over to the Patty Center, can follow the Alaska Nanooks at the NCAA Northeast Regional Tournament by clicking this hyperlink. 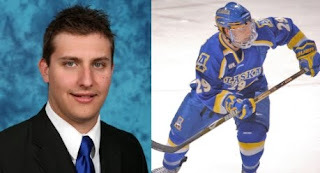 ATTENTION ALASKA HOCKEY FANS: The 16-team field for the 2010 NCAA Men's Ice Hockey Tournament is set and the Alaska Nanooks are the fourth seed in the Northeast Regional (being played in Worcester, MA at the DCU Center). They will face off against the No. 1 seed Boston College at 9:30 a.m. AKT on Saturday, March 27. More details (tickets, hotels, media coverage, etc.) to be posted later today on alaskananooks.com. Mariya Pavlovskaya once again swam faster in finals than she did in the preliminary heats. She dropped almost half a second in her 200 yd back to finish in 14th place with a time 2:04.19. Her time is over 4 seconds faster than her season's best. Mariya finishes the year with 3 Honorable Mention All American swims to her credit. By scoring all 18 of Alaska's points Mariya helped our team finish in 28th place out of 40 teams. Mariya Pavlovskaya qualified for her third final of the championships with her 12th place finish during the preliminary heats in the 200 yard backstroke. Her time of 2:04.46 is just off her lifetime best and her fastest this season by 4 seconds. Follow Alaska Nanook seniors Patrik Sartz, Jace Bures, Billy Galligan, junior Cody Rutter and freshman Dustin Chesebro as they seek to capture the program's 11th NCAA Championship title! 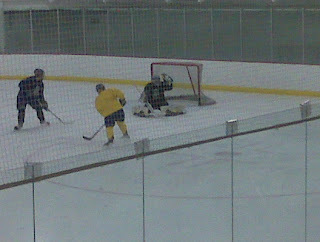 The Blue and Gold took to the ice for practice today only one day away from competing in the second round of the CCHA Playoffs. Here are some images from practice. Enjoy and check back for more hockey info and more info about our other spots at championships. The LED board at the arena has this displayed non-stop. The flags beside the LED board. As you can see we have the American and Canadian flag (standard) and the Swedish flag (not so standard). Do I have any idea why the Sweden flag is there? Sure, they are fans of Henrik Lundqvist (I think). We're in 20th place (out of 33 teams who have scored at least 1 point) with a team total of 15 points. With two more events for Mariya and Felina's best event coming up on Saturday, we look to add to this total. "It was great to watch our four skiers compete today in the NCAA championships - skiing classical cross-country. I am impressed with their ability to handle the change in elevation -- Steamboat Springs is at 7,000 feet above sea level! On to Saturday's freestyle competition!" Junior Mariya Pavlovskaya once again achieved Honorable Mention All-American status by winning the consolation heat of the 400 yard IM finishing in 9th place overall. She dropped over 3 seconds off her prelim swim which was already her best time this season. After her 11th place finish in the 200 IM, a 9th place finish in the 400 IM makes her two-for-two in events in which she's scoring points for the Nanooks. "Nationals are a very important competition and it's really exciting for me as an athlete to be a part of such an anticipated and great event. It takes a lot of commitment, endurance, support and motivation to actually make it through the entire season and get here. Nationals are like a summary statement that provides a conclusion to everything you did throughout the year. As a team we started in September and worked all the way through to the end and we had some amazing victories both in the pool and in school. My teammates' achievements and attitude helped me significantly to reach where I am right now. Every day they would prove their highest ambitions and their powerful will. I'm thankful to be a part of such an amazing team. This year Nationals take place in Canton, Ohio. It's pretty peaceful out here - no huge shiny buildings as in Houston, Texas, where nationals were held last year. This year our national team has been reduced to only two of us - Felina and me. Scott is the only coach who came here so it makes three of us from the University of Alaska Fairbanks. People here are not as friendly as in Fairbanks which makes me miss our campus a little. We got here on Sunday afternoon and settled down in one of the hotels which is close to the pool and the mall and all different kinds of restaurants. On Monday and Tuesday we swam four times which was nice and relaxing after the plane ride and helped us to get a feel for the water. I was surprised that the water temperature was the same as in our pool at home because usually the pools we compete in are much warmer. The pool is pretty good, not counting that the showers are ice cold and there are no locks on the bathroom doors so you have to hold the door when you go in. It brings some challenges to the settled routine we're used to once we're at the pool. There are many teams here and it's really challenging to get bleacher space. However, we are few and we managed to get a good spot and not get in anybody's way. Warming up in the main pool takes a lot of skill because it's overcrowded with swimmers who try to kick, sprint and do drills all at the same time. On the first day of the meet I swam my 200 IM and I consider that swim as one of my best races this year. I felt really smooth and relaxed. It was a good start to the championships. Today was my 400 IM and in the morning it felt harder than I expected. I was a bit disappointed that I didn't get into the "big" finals finishing prelims in 10th place. In the afternoon, however, I felt much better and I didn't even feel tired afterwards. So far nationals are going pretty well for me: I swam my best times this season and I'm very excited for the two races that I have coming up. This season has been a lot of fun. I was nervous at the beginning of the season: I wasn't sure how hard it would be for me to come back into the swimming scene after taking three years off. The girls on the team were very supportive in helping me get back into shape and get used to the demanding schedule. I'm surprised at how fast everything seemed to fall into place. My best meet of the season so far was the Toshiba Classic, a big invitational held in Long Beach, California, every November. This is where I made my national cuts in the 50, 100 and 200 freestyles. Thanks to that meet I'm able to enjoy the full experience of being a national level collegiate athlete. I was really excited coming into nationals for two reasons: the obvious reason is because it's nationals! but also because it's my last meet before I retire for a second time. Our journey to nationals started with a very long flight from Fairbanks to Canton, Ohio. Mariya, Scott and I all managed to get stuck in middle seats on the three and a half hour flight to Seattle. Of course we all got "trapped" next to interesting characters . . . The next two flights from Seattle to Chicago and Chicago to Canton, though long, weren't nearly as bad because I was able to sit next to Mariya and Scott sat in the emergency exit row most of the way. To make a long story short, we left Fairbanks a one o'clock in the morning and arrived in Ohio at close to five in the afternoon after traveling through four time zones. Monday and Tuesday we found ourselves at the pool both morning and afternoon to get used to the facility and work off the jet lag. The pool is a pretty nice 50-meter pool, separated by bulkheads with an attached diving well. On Monday we were able to stretch out and enjoy fairly empty lanes but when we arrived at the pool on Tuesday morning you'd have sworn the meet was just about to start! There were teams everywhere and it was a struggle to find calm water. Nonetheless, we accomplished what we needed to do and Mariya and I were both sprinting very well and feeling ready for the meet to start. Wednesday was the first day of the meet and I swam the 50 free. I was excited going into the 50 because this is the first time I've ever trained as a sprinter and I was feeling confident that I was going to have a fast swim. Unfortunately, I think my nerves got a hold of me. I pulled down in an awkward position on the start, which caused my shoulder to pop and consequently my start was delayed and my breakout suffered. In a 50 there just isn't enough time to make up for such a costly mistake. Even so, I was able to pull off a 24.24, a time just two tenths of a second off my lifetime best. Two tenths of a second doesn't sound like much to complain about but in a 50 it makes a world of difference, especially considering I had my heart set on breaking in to the 23s. Today I was hoping to turn things around. The 200 free was my favorite event all through high school and I was a high school All American my junior year. I've been focusing mostly on my 100 free this season but with all the work I put in training at altitude over the break, I felt that I would have a very successful 200 as well. Once again, I was a little disappointed in how things turned out. I felt confident and relaxed in the moments leading up to the race. Sadly, after about 125 yards, I felt like my body hit a wall and I struggled to finish the race. Thankfully I have Friday to recover from my last two events before I compete in the event I've been focusing on - the 100 free. I'm ranked very high going into the race and I'd love to make it into the championship final. It'll be a challenge, but it's a challenge I'm looking forward to conquering. Only after I achieve this goal can I look forward to my second retirement and starting a whole new chapter in my life. Alaska Nanooks senior Aurelia Korthauer was the top racer Thursday for the Blue and Gold as she finished 11th in the women's 5 kilometer classic race on the second day of the NCAA Skiing Championships. She crossed the finish line in a time of 17 minutes and 30.3 seconds, just missing a spot in the top 10 and All-American honors by 4.7 seconds. Sophomore Theresia Schnurr finished 15th in 17:42.5, while junior John Parry and freshman Tyler Kornfield took 22nd (30:52.7) and 25th (31:00.0) in the men's 10k classic race. We had a solid first day at the 2010 NCAA Skiing National Championships here in Steamboat Springs, Colorado. Senior Aurelia Korthauer led the way for the Nooks with a solid 11th place finish (out of 39) in the 5 km individual start classic event. She was less than five seconds out of All America honors. Sophomore Theresia Schnurr placed 15th, another good result for the women. 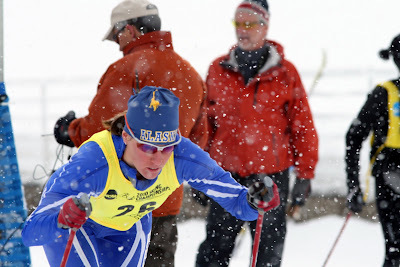 With only two women (out of a maximum of three for any one team), the Nanooks managed to place 7th out of 19 women's Nordic programs in the 5 km race. We even bested arch-rival Northern Michigan by two points. As a team, including yesterday's giant slalom alpine event, the Nanooks are in 13th place out of 22 teams. When we take alpine out of the picture, we are in 10th place among all Nordic teams. On Saturday we have the mass start free technique races. The men's 20 km race starts at 9:00 am (one hour earlier than published) and the women's 15 km event begins at 11:00 am (also one hour earlier than published). I am, of course, very proud of our student-athletes. They did a very good job today despite stressful weather conditions. Not only did they race well, but they handled themselves professionally and showed a lot of class before, during, and after the races. Thanks again for your ongoing support. More to come after Saturday's races. Mariya Pavolvskaya had the 10th fastest time during the preliminary heats of the 400 IM to qualify for the consolation finals tonight. Yesterday she finished 11th in the 200 IM earning Honorable Mention All American honors. Her time of 4:29.08 in the 400 IM is her fastest this season. It's Wednesday night in Marquette, Michigan. I've been asked to write a blog about the road trip so far, and I'm not going to lie, I have no idea what to write. We really haven't done much. It's been pretty "business as usual," but for those who don't know what that means, I guess I will go ahead and explain. We took the Red Eye out of Fairbanks Monday night/Tuesday morning, and arrived in Green Bay Tuesday afternoon around 4 PM (central time). We dropped off our stuff at the hotel, and pretty much went straight to the home arena of the Green Bay Gamblers USHL team for practice. To be honest, as much as I love hockey, it's usually not your first instinct to hit the ice after spending ten hours on airplanes and getting a combined total of three hours of sleep (if you thought putting your altitude-induced elephant feet into shoes was tough, try putting them into skates), but it's obviously the prudent thing to do heading into a weekend series. It's funny, though. Everyone always feels awful at the start of those fresh-off-the-plane practices, but you actually end up forgetting about all those factors after about fifteen minutes and you feel pretty good. It's kind of refreshing. So practice ended up being alright. There didn't seem to be any ill effects from the travel at all. After that we went for a 9 PM supper at the Prime Quarter Steakhouse. You pretty much get to choose any cut of steak you want and then cook it yourself on a massive charcoal grill. It takes a long time, but everyone considers it well worth the wait when they are eating their huge ribeye or filet mignon. Yeah, we all love the road trip experience (after the flights). We get treated so well. For the rest of the night we all just did our own thing (which for most guys meant "sleeping"). Today we woke up around 8:30 for breakfast. We went to the "full breakfast buffet" at the hotel which offered a wide variety of filling breakfast entrées, including cereal and instant oatmeal. Nobody has a problem with free food, it's just less of a thrill when fruit loops are your only source of energy before practice. Still, practice was great today. There's not much that can cause us to have a bad practice at this point in the year. The guys are so focused. There's not a lot talking about it, but we all know that we need to be solid in practice this week and have our best weekend of the year if we want to go to the Joe. The playoff butterflies are in the air. Just thinking about the Joe, and now the potential of a national tournament birth gives most of the guys goosebumps. I'm getting pretty anxious to play. Still, everyone knows that the key is to focus on the process and not the results, so we all pretty much have to force our thoughts onto the present and forget about possibilities. Regardless, this is the best part of the year. Who doesn't love playoff time? We then drove to Marquette from Green Bay, which took us about three and a half hours. We then had a very nice dinner in the upper room of our hotel, the Landmark Inn (an incredibly classy and expensive looking place that is apparently haunted. Look it up) and then were given a few hours to relax. We really do get spoiled. Later in the evening we went bowling as a team. For humility's sake, I'm not going to go into detail about my team of Andy Taranto, Dustin Sather, and Scott Greenham winning the combined team score event and subsequently earning desserts for ourselves tomorrow, but we absolutely dominated. Actually, we barely slipped into first. 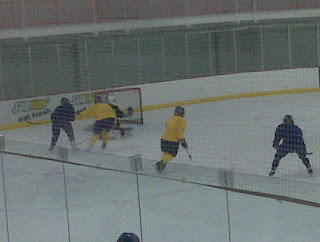 It was pretty close between us and Cody Rymut, Coach Meisner, Derek Bradish, and Adam Cardwell's team. There are a lot of good bowlers on the team, especially considering most guys only go once or twice a year. I think everyone had a lot of fun. Tomorrow, we have a 9 AM breakfast and a 5 PM practice with nothing scheduled in between. That means around seven hours of guilt-free time killing. We are going to have to find something fun to do. In the evening we will have a video session and then we will all attempt to get a good night's rest before the first big game. That's about the gist of what goes on while we are away from Fairbanks. Thanks for reading, but better yet, thanks for the support of the team as we set out to bring a championship to Fairbanks. 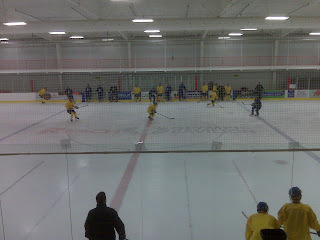 The Alaska Nanooks Hockey team took to the ice this week after a very long road trip to Green Bay, Wisconsin. 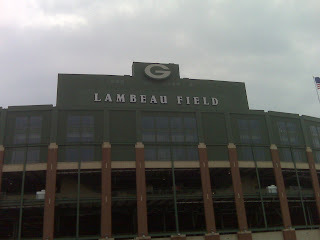 The Nanooks go into Green Bay and stayed there on Tuesday night at a hotel right beside the Green Bay Packers training facility and Lambeau Field. The Nanooks left Green Bay and practiced just before leaving for Marquette, MI where they will face Northern Michigan on Friday and Saturday. Alaska will practice tomorrow at Northern Michigan before they take the ice for the first game of the best-of-three series against the host Wilcatst at 3:35 AST on Friday afternoon. Congratulations Mariya! The Nanook Junior dropped two seconds from her prelim time nearly breaking her varsity record and moving up three places to finish 11th in her first event of the Championship! Her 2:06.09 was her fastest this season and nearly as fast as she swam last year in a high tech suit. Those suits have been banned from swimming world-wide so this year our team is wearing normal lycra suits. That time is the fastest Mariya has ever swum at an NCAA championship meet. Mariya felt super strong in her 200 yard IM this morning. Her time wasn't her best, however, it was good enough to get her a second swim. Tonight she'll race in the consolation heat due to her 14th place finish from this morning's prelims. The top 16 swimmers swim in finals. Her 2:08.02 is slightly slower than her time at the US Short Course Nationals last December. Because of the tremendous success she had training this year with her dedication to gaining as much endurance as possible, she never got tired in this morning's race. She'll sprint the entire 200 tonight and should drop her time considerably. Prelims for Day One are in the book. Felina swam well but didn't make it to finals. She has a chronic shoulder injury that she aggravated during her start. The pain of "throwing her shoulder out" was enough to cause a poor entry and a bad breakout. Even with that kind of start she was still within .17 of her best time finishing with a 24.24. In the end, however, she wasn't able to capitalize on all the sprint training we did this year and she finished in 32nd place. She knows to be careful with her start tomorrow in the 200 yard freestyle. Alaska Skiing's former assistant coach Ingrid Olson (left) and current assistant coach Matt Dunlap (right) and are out on the trails today testing wax to see what will be the fastest for the four skiers competing at the 2010 NCAA Skiing Championships on Thursday and Saturday in Steamboat Springs, Colorado. Coach Jerome says "The testing is going well, though things look like they will be different on Thursday for the classic race. It was warm and sunny today with soft, wet snow, but more snow is expected tonight and temps may fall. The kick wax has been klister, but that may change depending on how much snow falls." Mariya Pavlovskaya: It is a fast pool and feels really good. Although we're having lots of fun, we also remember that we will have to race in a day. I'm very excited and looking forward to it:) And the dinner tonight was amazing! Felina Rosadiuk: The pool is pretty nice. The water is crisp and clean. The showers are cold! And the water level (gutters/deck) gives the pool a nice taste of home. I think this meet is going to be a fast one! Senior Felina Rosadiuk, Junior Mariya Pavlovskaya and coach Scott Lemley have finally arrived in Canton, Ohio. 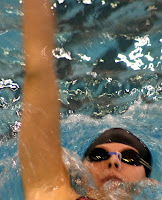 Wednesday the 2010 NCAA National Swimming & Diving Championships will begin and for 4 days Nanook swimming will shine. We left Fairbanks during a snow storm Saturday night having been up all day tying up loose ends so we could leave town with a clear conscience. We arrived in Canton at 6:00 pm tonight, found our hotel, grabbed a dinner to go from Panera and are settling in. Tomorrow morning we'll try to get on the wake-sleep schedule that we'll follow the rest of the week. We're taking two girls to NCAAs this Saturday. 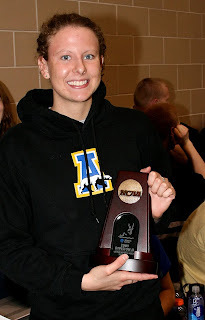 Last year Mariya was an All-American in the 400 IM. 2010 Governor's Cup CHAMPIONS!! In case you missed the celebration, here's a montage that Megan Otts and Todd Paris compiled (thanks again)! Playoff Tickets go on sale today at noon at the Patty Center and all Ticket Master outlets. Click here for more information. 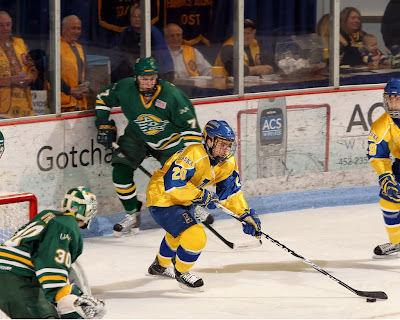 Senior forward Dion Knelsen has been named one of seven finalists for the 2010 BNY Mellon Wealth Management Hockey Humanitarian Award, given annually to the college hockey player that most personifies community spirit through leadership, effort and time. Click here to read the full release. He is also ranked second in fan votes (with 13.2 percent) for the 2010 Lowe's Senior CLASS Award. YOUR VOTE COUNTS! Fan balloting counts for 1/3 of the total with the remaining 2/3 determined by NCAA Division I coaches and national media members. Log on to the LSC Award website to vote for Dion. You can also text H5 to 74567 once a day (that's up to two votes per day per person). Congratulations to freshman forward Andy Taranto and sophomore defenseman Scott Enders, who were named the CCHA Rookie and Defenseman of the Week, respectively, on Monday. Here's the full release. Don't forget this weekend's WHITEOUT for the playoffs. Sport your white gear (from head to toe if possible) or get over to the bookstore to buy some - there should be special discounts on all white Alaska Nanooks merchandise this week only.